CLG is a joint venture of Chevron and ABB, the engineering giant. Chevron provided the chemistry, ABB provided the engineering for some advanced refinery technologies. We worked with Chevron, which had marketing responsibilities. The goal was to give some life to a new brand. 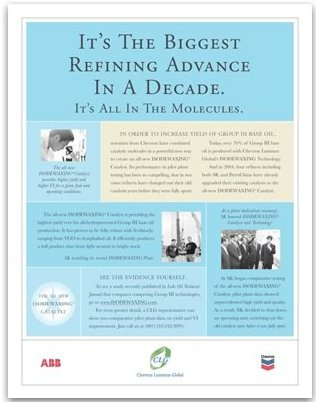 Our objective was to establish credibility by referencing the Chevron legacy of refining technology R&D and innovation, and in a series of endorsement ads. These ads significantly raised CLG’s profile and help define a kind of geeky-science nerd image. The “believability” ratings were off the chart. While the ads ran, CLG scored impressive wins in India, Europe and the Middle East. 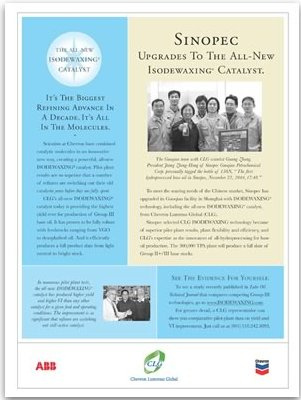 One nice little touch – you may not be able to see it here – is the icon that introduces “The All-New Isodewaxing Catalyst.” Now, you probably didn’t even know about the old isodewaxing catalyst, did you? Next time you open up a refinery, you’ll be glad you read about it here.